One of the finest maps of Whitestone, Queens, New York City. Part of Whitestone Village. Town of Flushing, Queens Co. L.I. / Part of Whitestone Village. Town of Flushing, Queens Co. L.I. 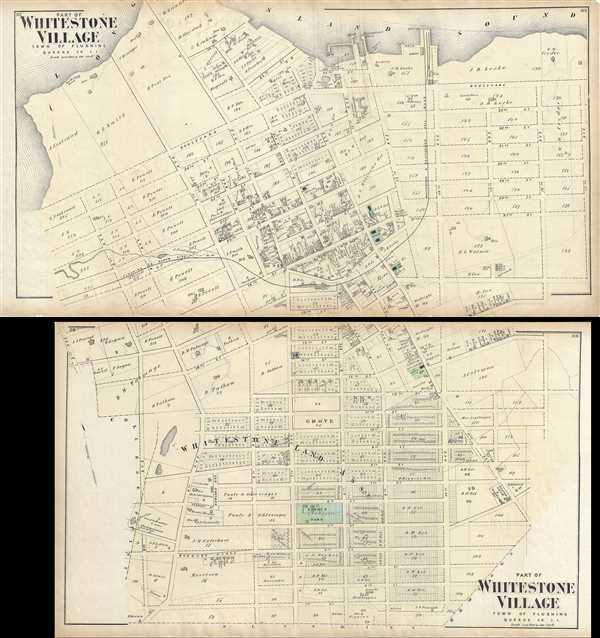 A scarce example of Fredrick W. Beers' two map set of the community of Whitestone, Queens, New York published in 1873. Roughly covers the area between the modern day Whitestone Bridge and the Throgs Neck Bridge. More specifically, upper map depicts from 3rd Avenue to 17th Avenue, and Boulevard to 17th Street. Lower map covers from 3rd Avenue to 14th Avenue, and from 16th Street to 1st Street. Detailed to the level of individual properties and buildings with landowners noted. This is probably the finest atlas map of Whitestone, Queens, to appear in the 19th century. Prepared by Beers, Comstock & Cline out of their office at 36 Vesey Street, New York City, for inclusion in the first published atlas of Long Island, the 1873 issue of Atlas of Long Island, New York. Very good. Some toning and edge wear. Minor spotting. Minor verso repairs, including centerfold reinforcement. Set of two maps. New York Public Library, Map Division, 1527295, 1527296. Rumsey 0066.044, 0066.045.